‘Hijab, Meaning, Identity, Otherization and Politics: British Muslim Women’. A report by Saied R. Ameli and Arzu Merali for the Islamic Human Rights Commission. Publication date: 26th January 2006, ISBN 1-903718-26-0, 84 pp. You can order this volume online. Click here for a hard copy or click here for a downloadable PDF. 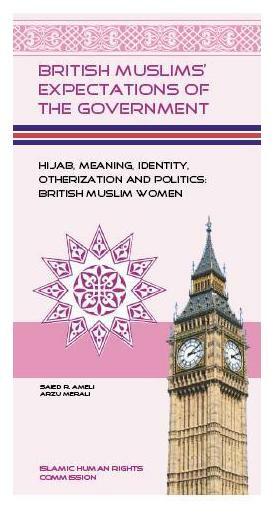 The summary follows..
‘Hijab, Meaning, Identity, Otherization and Politics: British Muslim Women’. A report by Saied R. Ameli, and Arzu Merali for the Islamic Human Rights Commission. Publication date: 26th January 2006, ISBN 1-903718-26-0, 84 pp. The fourth report in the British Muslim Expectations of Government series has been commissioned to highlight and identify Muslim responses and requirements. It aims to record the main areas of concern in regards to Hijab. The wearing of Hijab has always been controversial, especially in a post 9/11 climate which has seen Hijab bans in both France and Turkey and the case of a British student, who was excluded from school for wearing a jilbab (full length overcoat). This report particularly aims to voice the views of both men and women who recognize or affiliate to the concept of Hijab and to present recommendations to the government by analysing responses from a nationwide survey of 1200 Muslims, qualitative answers of 56 Muslims and 365 quantitative questionnaires from IHRC’s 2003-2004 survey entitled the ‘Hijab-Project’. The findings in the report negate the misconception that women who wear Hijab out of choice and choose to affiliate to it, are disadvantaged. Instead, it reveals the concept of Hijab to be an identity which individuals have chosen to identify themselves by. – An overwhelming 81% of respondents state Hijab to be the most important or one of the most important values. – Before 9/11, 60.8% of women who wore some form of Hijab experienced being talked down to or treated as if stupid. This figure rose to 68.5% after 9/11. – The majority in all levels of education, except PhD assigned Hijab as one of the most important religious values and for those with a PhD, the majority still believed it to be a very important religious value. Respondents saw Hijab to be a form of protection, identity, religious obligation and a reminder to behave in a dignified manner when in public. Other reasons cited were acting as ambassadors of Islam and as a form of Da’wah (proselytism). Sporting Hijab was attributable to modesty and respect according to some respondents. Both female and male respondents clarify that Hijab is not merely a piece of cloth but a concept which applies to both genders and symbolises the concept of modesty. For the majority of female respondents, Hijab was worn for spiritual reasons such as obedience to God. In addition, Hijab worn out of free choice was considered a liberating experience. The majority of the respondents felt that Hijab was a way to assert their Islamic identity and had been a positive experience, in contrast with their negative experience of discrimination at work or the anti-Muslim sentiment in social settings. However, this was overridden by the satisfaction gained by wearing the Hijab; a coherent view of emphasizing Islamic identity, through choice and intention, is recurrent in responses. Rife stereotypes of Hijab remain encrusted in society and for the most part, blame is placed on the media, however schools, government and the behaviour of other Muslims is also blamed, which further emphasizes rampant stereotypical views. There was a decrease in those who had not experienced being made fun of or ridiculed for being Muslim pre 9/11and an increase in such negative representation in a post 9/11 climate. – Subsequent to 9/11, 59.9% of respondents said they had been made fun of or ridiculed for being Muslim. Pre 9/11, 52.9% of respondents had never been ridiculed. -Hijab, nikaab and jilbab, as distinct Islamic dress, generated differences in experience with those who did not dress in a visibly Muslim manner. – Regardless of respondents’ levels of affiliation to Hijab, figures of perception of Islamophobia, in the media, were relatively high, showing 62.4% of respondents believing the media’s representation to be Islamophobic. – Of those who did encounter such stereotypes, there was a steep rise from 9.6%, pre 9/11 to 29.9%, post 9/11. – 32.3% of respondents had never experienced being treated according to stereotype. This figure dropped to 18.9% after 9/11. -23.3% of women surveyed, perceived themselves to be frequently treated according to stereotype. This figure rose to 44% post 9/11, from between once a month to more than once a week – a sharp rise of 21.1% – which is almost double the former figure. As with previous findings in this series, respondents with high affiliation to Hijab have a strong sense of belonging to Britain, running counter to the notion that obvious displays of religious affiliation are equivalent to rejection of Britain or wider society. Female respondents have shown a strong sense of belonging and willpower to maintain their Hijab and their Muslimness, regardless of possible laws or policies which could ban the Hijab. The overall response from the findings has been that most respondents find that the government disrespects Muslims, a recurring notion in previous volumes in this series. – Most women surveyed in regards to their pre and post 9/11 experiences, saw a significant increase in anti-Muslim comments from politicians. Pre 9/11, 28.2% of respondents felt they had heard such remarks once a year, this figure falling to 11.5% subsequent to 9/11. Furthermore, 26.8% of respondents claimed they had never heard any such remarks. This figure later fell to 12.6%. -Post 9/11 24.7% of respondents claimed to hear such comments on a monthly basis. – A significant number of respondents made it clear that they would not be willing to compromise on wearing Hijab if policies to ban it were enforced, despite otherwise respecting the law of the land. Controlling, defining or negotiating sexuality? Hijab has been viewed as a mechanism, to control female sexuality, yet participants in this study have stated the removal of both male and female sexuality in everyday relations is necessary and therefore, they recognize Hijab to subvert the male gaze and resist objectification. Egalitarian rights talk is emphasized by respondents who feel sexuality should not be expressed in the public sphere. No participants in the survey felt the conscious wearing of Hijab as oppressive in any way, although problems were encountered, in terms of responses from family, friends, peers and wider society. The mistaken belief that Hijab is a practice of designating inferiority and gender discrimination is overshadowed by male participants’ responses. Male respondents felt the concept of Hijab can be applied to both sexes. Although manifested in different ways (men are not obliged to cover their heads but still need to dress modestly), it was equally as important for both to observe Hijab. Hijab was seen by some men as ensuring that women could participate in wider society and not be sexually exploited. What is the effect of wearing Hijab in the UK? Studies have shown British Muslims to feel a sense of belonging, alongside that of rejection, which is demonstrated in experiences of wearing Hijab in Britain. -The events of 9/11 have seen the rise of discrimination in the form of being ignored, overlooked stared at or moved away from. -Hostility at work was assessed showing a rise from 30.1%.which reports an atmosphere of hostility at work before 9/11; a rise to 43.8%. Some of the Muslim women surveyed also felt there was a glass ceiling if and when they try to attain top ranking jobs. -Some types of hostility and discrimination are prevalent in respondents’ everyday life experiences and expectations so much so that their lives are made up of this for example, in school settings, work, public transport and a variety of social arenas. What should the government do for Muslim women wearing Hijab? A call on the government to condemn Hijab bans in various countries. A strong sense of individualism and collective Muslim identity is visible, as findings have shown that women are ready to stand up and object against Hijab bans. Unfortunately, negative experiences have become the norm within the lives of some Muslim women, therefore some cases of discrimination have come to be tolerated. Stereotyping, characterized by media vilification and ridicule, effects the daily lives of Muslim women in addition to the government and high profile political figures who have committed similar failings. The report concludes with proposals for the government and policy makers to consider. In compiling this report, 1125 quantitative and 56 qualitative surveys were conducted, documented, analysed, and presented. The quantitative questionnaire was part of a major survey carried out by IHRC and reported in the last three volumes of the British Muslims’ Expectations of the Government series. Furthermore, data from IHRC’s, 2003-2004 ‘Hijab Project’ consisting of quantitative questions from 365 women living in the UK, was explored throughout. ·Both the qualitative and quantitative surveys were undertaken in various localities across England, Wales and Scotland. ·The diversity of Muslim ethnicities was represented across the survey. ·Respondents’ ages reflected the predominantly youthful make-up of the British Muslim community. ·Approximately 90 percent of our respondents are British citizens and 55 percent are born in Britain. ·The majority of respondents saw themselves as practicing Muslims. To order the report please click on the link below or please call the office on 020 8904 4222.